Now on to the Hop, we were challenged to create a card for Valentine's day to send to one of our fighting men or woman, our family is still on our annual Cabin retreat so I had to make due with what I had on hand, I will come up with a little something different next week when we get home. Recipe for this card is at the end of the post, also look back on Veterans day to see a sample of all the cards we created to send to Operation Write Home. The first person to comment on this post and e-mail me a photo of a card you will be sending to Operation write home will receive a FREE Celebrate Everyday Card Kit! awwww, what a loving card...that's going to make someone at home really smile! Love the scallops! Thanks for sharing! What a lovely card! Thanks for sharing it with us. Very pretty, it will be precious to someone special I know. 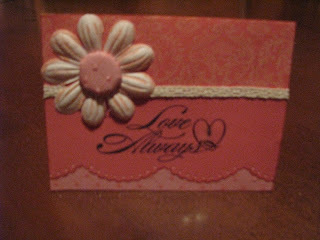 Lovely card... thanks for being in the blog hop and for helping to spread the word about OWH. Super cute card! Thanks for supporting OWH!! Your card is fabulous! I love your lg scalloped border. Don't you love all the fabulous cards that you've seen today! I love your card! Thanks for hoppin! As a military wife I must give a great big thank you for participating and sharing your talents! Such a sweet card--it will no doubt make the day of a hero's loved one. Nice one! Thank you for sharing! Isn't this fun??? :D I love it! Pretty card! Thanks for supporting our heroes!